One of our core specialties is Unified Messaging. We offer a wide range of PBX options and servicing for VOIP, SIP Trunks, IP Telephony, and auto-attendants along with collaboration for voicemail, email, and fax. Along with our primary partners Microsoft and Cisco we can offer any technology you might need. 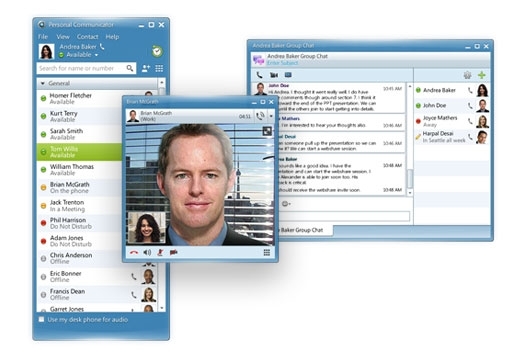 • Chose to IM, call, or video conference anyone at the touch of a button. • We can set it up so you have one phone number, one phone, or both. Cisco IPT allows your cell phone to be transferred into a work extension while at the job site and back into a mobile once you leave. Stop carrying around two or more cell phones and save money! Lease options make Cisco the most affordable setup in the industry. The future is here and we can show you how technology can save you money and raise productivity. Having the right support makes all the difference in the world. Contact Us today for a free Expert consultation! Microsoft® Unified Communications solutions harness the power of software to help streamline communications between people, whether down the hall, across continents, or constantly on the go. These technologies allow organizations to adapt to changing business needs with a secure, extensible platform that spans communication modes, including e-mail, voice mail, calendaring, telephony, instant messaging, and conferencing. Call us today for a free no obligation consultation of your communications infrastructure. Welcome to the TeamKennington services page. While the above are just samples of the services provided, we encourage you to browse through them for some details using the navigation links above. TeamKennington utilizes a scalable portfolio of managed services to enable business continuity, disaster prevention, and operational efficiency. If you're not 100% certain about the value you currently receive for your IT Support call us today for a FREE NO OBLIGATION NETWORK ANALYSIS from a certified expert and see the difference we deliver!